Luan Gallery is thrilled to announce its winter exhibition entitled: CAST featuring the sculptural works of Cecilia Bullo, Don Cronin, Gabrielle Sampson, Katherine Sankey, Kevin Killen, Martina Coyle and Mel French which opened on Saturday 06th October, continues until 30th November 2018. This group sculpture exhibition features the work of seven artists based in Ireland exploring new ideas using traditional and new mediums. 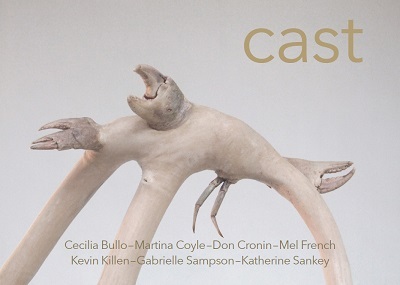 CAST takes a comprehensive look at the various manifestations of sculpture in Ireland today. The exhibition showcases figurative and abstract works in a range of media such as wood, metal, clay and resin as well as light installation and mixed media. Visual Artist Aideen Barry launched the exhibition on Saturday 06th October at Luan Gallery. "Our modern world is ever evolving into the realm of virtual experience whereby we live in a kind of in-between, our-selves in the here and now, and our virtual selves being pulling into "A Mirror Darkly" of hand held portals of smart phones and iPad's, of social media streams, of feeds, of avatars. We have become Ghosts, pulled between this life and our constantly on, ever demanding internet life. It has made us howl for something different and yet something familiar; something hand-made, a process, a commitment to materiality, perseverance between mind and matter and to a grounding in weight, surface, and mass. The works in this show offer us a kind of ballast to the pressures of being spirits and yet they too, hold the soul of the artist. Something has been birthed into these objects and it is something to behold and something astonishing."